It was really nice last week. Each day when Mam came back from her golf (it’s always golf, we think), she put us out in the garden for a wee while, even when it was nearly dark. It wasn’t really dark. The darkest day we only went out for a few minutes, but it was good for a leg stretch and some grass. Thursday Neville and me had a bath. We don’t like having baths, but it’s good afterwards. My hair goes soft and silky, and so does Neville’s. His bottom stops smelling riper than is polite, too. We get an extra long cuddle (I don’t like long cuddles) and get a warm blowy noisy thing held over us before we go for our run. It does make you feel nice and warm, though. Saturday was great. Mummy was not in golf clothes, and we went out into the garden runs at lunchtime. That’s earlier than we’ve had all summer long, I think. The runs had moved onto fresh grass. We made good work of that, I can tell you. Mam made good work of planting seeds in the veggie patch with the chard and winter lettuce. There was a lot of air blowing about, almost as warm as that hair drying thing Mam used on Thursday. We were in a sheltered part, between the plant that’s escaped from its pen and the wall, where there’s lots of grass. Bertie was beside us. He’d moved only a little way, next to where he’d been before. And the other end was Biggles. Mam said to eat as much as we liked because we wouldn’t be coming out much longer. How right she was! Sunday was wet as could be and Mam said it was cold out, too. Today Mam’s gone out early in her golf uniform again, but she’s got extra layers on. It’s funny how she manages to get extra layers of coat on. We just fluff up our hair a bit more. Mam said to send a special note to Auntie Noelle, because she’s been suffering from the hurricane, which is even windier than our wind. That must be really something, Auntie Noelle. And also we’re still thinking solidly for Uncle Mo, and hope the treatment’s okay and the human vet people are looking after you well. Love and kisses from us. And love and kisses to you too. This week the sun was shining a lot, and some days Mummy brought us in some real grass from the garden. It’s not long, and there’s not much of it, but it’s really nice. Mummy says it’s far too cold for us to go out yet. Although Roscoe told me that a few days Mummy has left the door ajar when she’s gone out and he didn’t think it was that cold. My teeth seem to be working properly again, and Mummy’s very pleased with me. I’m not sure my bottom is working properly, though. Sometimes it feels a bit sore then Midge comes and asks what’s wrong and I tell him to go away. Then Mummy asks what’s wrong and why are we bickering. I think she thinks I might have something wrong, but doesn’t know what. I suppose that means I’ll see Dr Sally soon. Maybe it’s a good idea, but I prefer to be left to get on with things quietly on my own, really. Roscoe’s very happy cos he’s off his meds, and even happier because he’s finishing up any of my special brew that I don’t drink in the mornings. His scar is all healed with no more stuff underneath it, and his hair is growing back. Neville’s teeth are growing too. They are about three-quarter length, and Mummy says she needs to make sure the bottom ones don’t grow too long and upset the balance of his chewing. And that’s the news from here, really. It would have been Victor’s tenth birthday tomorrow if he’d still been here. That’s ancient. Is this the real grass? Is it just fantasy? 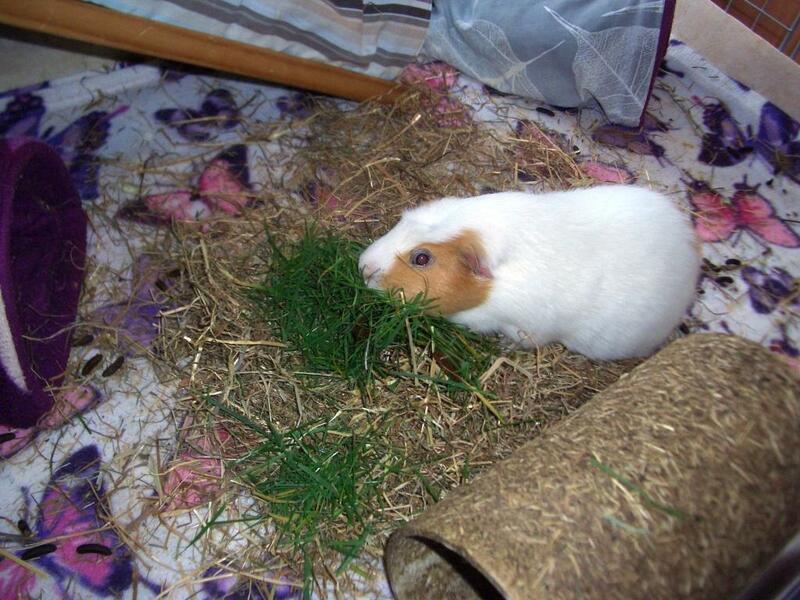 Mummy gave us a pile of grass the other day. It was sunny all day. She was out in her golf things as usual. When she got home it was too cold for us to go out. It’s not fair, is it? You agree with me, don’t you? But she did go into the garden and pick some grass for us. It was a big pile. Well, Percy and Midge had a pile that was twice the size of mine. But that was for two of them. And Midge is twice the size of me anyway. On Saturday it was pretty dull and wet. It wasn’t cold though. Something called ‘the heating’ came on. It made it very comfortable, especially in the early morning. Mummy didn’t go out in the garden, according to Oscar, who sometimes tells me these things in the morning. She took the rubbish out, but said it was raining. But in the afternoon she came round to all of us with a big tub of grass. She gave us a handful each. It was very dry. Very very dry, but it wasn’t hay. It was green. It smelled more like grass than hay, but stronger than fresh grass. I ate some of it then left the rest for later. Percy says it’s called Ready-grass. It’s okay, I suppose. Not as good as real grass, but better than nothing. Percy says I’ve never had nothing, so how would I know? I just do, that’s all. Ready-grass is okay, but not much like real grass. It must be fantasy grass. Mummy was out for over an hour today, in the garden we think, although she may have gone to her other garden. She has two now, one is at the new Village Hall. That’s not hers, though. She just spends time there. And we reckoned, if it was sunny and she was out all that time, there must be some grass in the garden. So when she came back we wheeked and looked starving, and Dougall did a great job of looking sad and hard-done-by. Here’s Kevin with his share of the spoils 🙂 It was delicious. It didn’t last long, though.